Coming to the field, farmers went into mad panic watching clam died en mass. Some lose hundreds dong while some lose billion dong. An outbreak of unknown died en mass of clam has happened in the lead-up to harvest recently in large areas in Hải Lộc commune of Hậu Lộc district, Thanh Hóa province. Farmer Phạm Quang Minh living in Tân Lộc village, Hải Lộc commune said that his family had two hectares of clam seed and clam meat that suddenly had been found dead in the lead-up to harvest. His investment of one billion dong has been drifted. “Not only did I lose all my money, but also my family had to spend million dong per day on hiring workers to clean dead clams off the field”, said Minh. 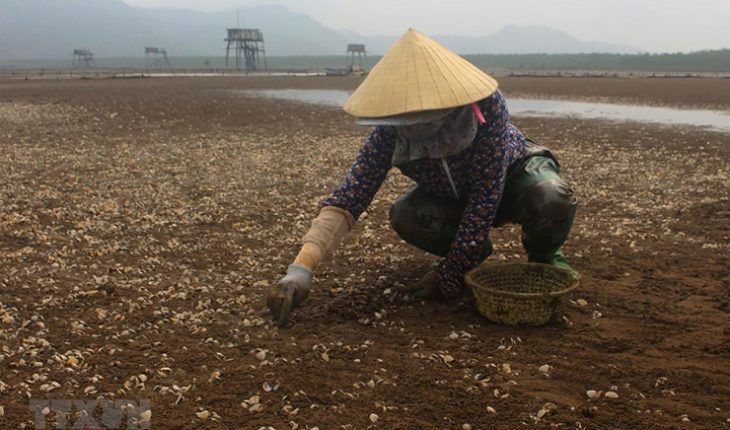 Being considered the leading farmers of clam in Hải Lộc commune, Phạm Văn Quý living in Lộc Tiên village said that he suddenly found dead clams when going to the field about previous ten days. Some days later more and more clams were found dead, and the field was fully covered by dead clams then. He had 6ha of clam farming area and lost three billion dong due to this event. Besides, he had to spend 4-5 million dong per day to hire workers to clean dead clams. Hundreds of clam farming households are suffering the same situation. Some has 1ha of dead clams, some 5-7ha, leaving total dead clams of thousands of tons and damages of hundreds of billion dong. According to local farmers, most of them borrowed money from banks by mortgage of land certificates. Mortality outbreaks of clam has left them unable to service their debts. Farmer Nguyễn Văn Hinh living in Y Bích village of Hải Lộc commune said that his family received a loan from the bank and invested 400 million dong into clam fields. “Not they are all dead, I am really panic thinking about my debt”, said Hinh. In the meeting on April 24, Chairman of Hải Lộc People’s Committee Nguyễn Quốc Tý said there had been 248 households suffering from mass clam deaths. 161 households had 70-100% of their clams found dead while others 30-70%. The initial estimated statistics amounted to thousands of tons of dead clams, leaving damages of hundreds of billion dong. “Currently, the event had been reported to functional agencies of Thanh Hóa so that they would take samples of dead clams for test to find the cause to such mortality.In the meanwhile, teams are formed to statistic damages”, said Tý.